Space tourism has long been a factor in the aerospace industry, although until recent years no attempt has been truly successful. In the 1960s, Pan Am and Thomas Cook began a register of names for those interested in lunar tourism. In its heyday, the list numbered nearly 93,000. 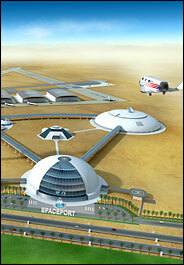 After a lull, space tourism is once again becoming big business and the means to make it a reality have arrived. The first space tourists were the American businessman Dennis Tito, who spent 10 days in orbit in 2001, the South African Mark Shuttleworth, who similarly forked out $20 million for an 8-day stay aboard the International Space Station in 2002, and the New Jersey businessman Gregory Olsen, who flew to the ISS in September 2005. 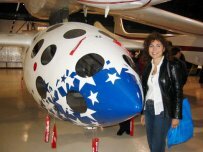 Iranian-born American businesswoman Anousheh Ansari became the first ever female space tourist in September 2006. A member of the family which sponsored the Ansari X prize, she was a last minute replacement for Japanese businessman Daisuke Enomoto who failed his medical tests. Like her predecessors, she flew to the ISS aboard a Russian Soyuz capsule, spent a few days aboard the station, and came back on the same spacecraft with the returning professional crew of the ISS. Next up will be a 58-year old billionaire software engineer – the Hungarian-born Charles Simonyi, who led the development of Microsoft's Word and Excel. He's scheduled to blast off onboard a Soyuz spacecraft on March 9, 2007. All of the amateur space excursions to date have been arranged by US-based Space Adventures. Among other wealthy or aspiring hopefuls who didn't make it into space are the boy band singer Lance Bass, model Cindy Crawford, and former NASA associate administrator for policy planning Lori Garver. Today, several companies have waiting lists of wealthy individuals who want to travel into space as tourists, on anything from sub-orbital flights to trips around the Moon. Among these companies are Richard Branson's Virgin Galactic, which plans to fly a larger and modifed version of the pioneering SpaceShipOne, known simply as the Virgin Galactic spaceship, from (among other locations) Spaceport America. Las Vegas-based Bigelow Aerospace plans to place a modified version of the NASA-designed TransHab inflatable habitat into orbit. How many of us want to go? A Maryland-based aerospace consulting group called Futron Corporation received a $1.8 million contract from NASA to carry out market research on the potential for commercial space travel and tourism. Futron commissioned the public opinion pollster Zogby International to find out if wealthy Americans want to go to space. In January 2002, Zogby telephoned 450 rich Americans with annual incomes above $250,000 or whose net worth was more than $1 million. Seven percent said they would pay $20 million for a two-week orbital flight and 19 percent said they would pay $100,000 for a 15-minute sub-orbital flight to an altitude of 50 miles. If the price of a two-week flight dropped to $5 million, 16 percent would be interested. 1990: Mission to Mir – TBS pays $12 million for journalist Toyohiro Akiyama to fly to Mir. 1999: Richard Branson founds Virgin Galactic Airways. Apr. 30, 2001: Dennis Tito pays $20 million to travel on a Russian Soyuz rocket to the ISS, becoming the first tourist in space. Mark Shuttleworth (South African businessman) makes the same journey April 25, 2002, making him the second. Sep. 27, 2004: Richard Branson enters into an agreement with Mojave Aerospace Ventures (a Paul Allen company) to license technology for commercial space flight. Oct. 14, 2005: Virgin Galactic announces the names of the first 100 people who have signed up to fly aboard Virgin Galactic spaceship beginning in about 2008. Sep. 17, 2006: Anousheh Ansari becomes the first female space tourist.